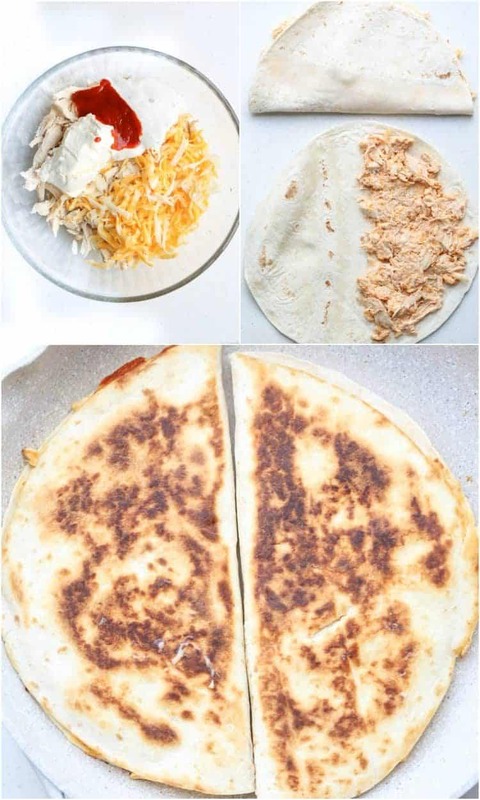 Sharing an easy homemade Chicken Quesadilla Recipe. Amazing combination of shredded cooked chicken, cheese, spicy mayo sauce in a tortilla, cooked until the tortillas are crispy. This is similar to Taco Bell’s quesadillas but so much better. 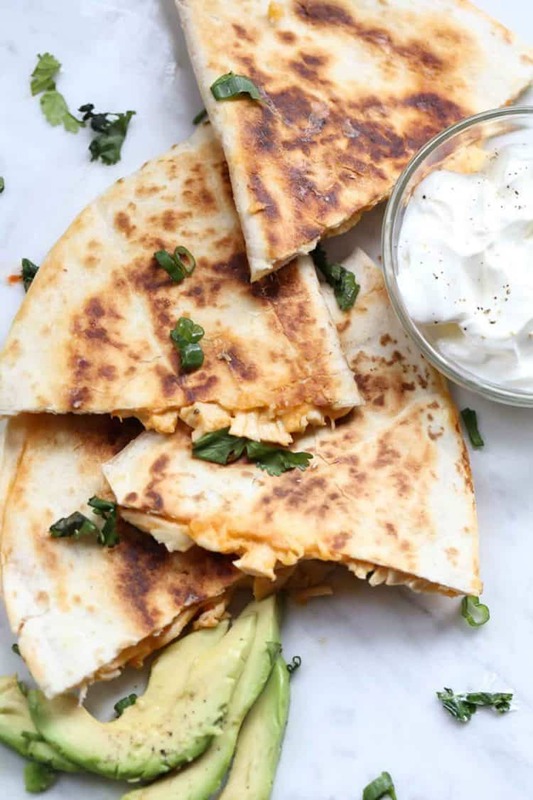 These quesadillas and our Easy Pizza Bites are the kids’ favorite food for after school. 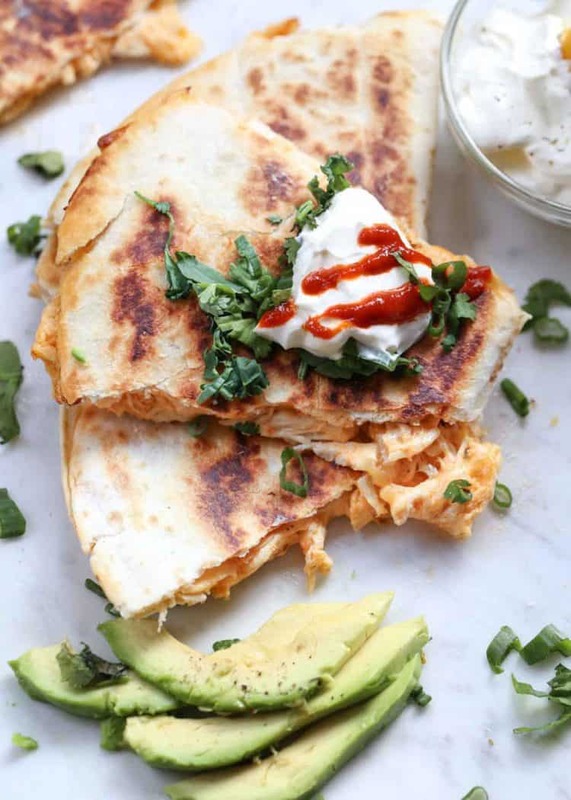 The quesadillas were inspired by our Buffalo Chicken Dip and taste similar to the popular dip. Though quesadillas originated from Mexico, they are popular throughout many restaurants, served with different fillings. This recipe has chicken and cheese with a spicy mayo combined and spread in flour tortillas. The tortillas are sauteed and become so crispy on the outside and the filling melts and becomes so cheesy on the inside! I love this recipe because it uses ingredients you most likely already have in your pantry. It takes about 5 minutes of prep time to make the quesadillas and another 5 to cook them. Lunch or dinner can be on the table in 10-15 minutes. What I love about this recipe is that you can make the mixture in advance and refrigerate it. Then, when you’re ready to serve them, assemble and cook the chicken quesadillas and they are ready within minutes. You can store the mixture in the fridge for several days. These are great for when your kids come from school and need a snack. can I freeze chicken quesadillas? Yes, these chicken quesadillas are really great to freeze. Completely make the chicken quesadilla recipe, close tightly and freeze in a Ziploc bag. Just thaw the quesadillas to cook them. It’s so easy to prep, make and freeze these quesadillas. You then have dinner for busy evenings or for when kids come home hungry after school. This recipe calls for cooked chicken. You can either use canned chicken or cook your own chicken. To cook chicken- In a saucepan add half part chicken broth, half part water. Season with salt and pepper. Bring chicken to a boil (remove any scum that rises to the top.) Turn heat down to low and simmer 15-20 minutes, until desired tenderness of chicken is reached. Once the chicken is cooled, pull apart with a fork or shred with a Kitchen Aid mixer with the flat beater attachment. If you love spicy food, add more sriracha (or hot sauce). Grating a block of cheese is better than pre-packed shredded cheese. Performs better in recipes. If you have a non-stick pan, oil doesn’t need to be added when cooking. If you don’t have a non-stick pan, or want the quesadillas really crispy, lightly grease the pan with oil and heat before adding quesadillas. what kind of chicken do I use? Any cooked chicken will work in this recipe. Canned chicken, leftover chicken, or rotisserie chicken shredded will all work great in this recipe. 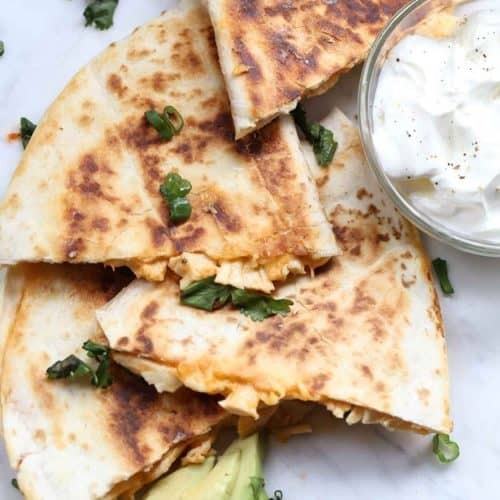 These chicken quesadillas may be served with guacamole, sour cream, avocadoes or even your favorite salsa. Amazing quesadilla recipe. Chicken and cheese stuffed flour tortillas cooked until crispy on the outside and cheesy on the inside. You can have these done in 10 minutes. Spread some of the chicken mixture on one half of a tortilla. Bring the other side over and pat down. Drizzle oil into a large skillet (or keep dry) heat oil. Cook about 2-3 minutes, per side (until tortillas are crispy and filling is hot). I love a good quesadilla recipe! It always makes for one quick meal and this spicy chicken filling looks so delicious . I love that you added Sriracha! My kids are hugely into quesadillas at the moment, that they actually make themselves. I can’t wait to show them this Spicy Chicken Quesadilla recipe. My son is a big fan of anything spicy! Whenever I have leftover chicken at home, chicken quesadillas are the first thing that comes to mind. This recipe looks delightful Valentina. I will definitely be trying your spicy version out! 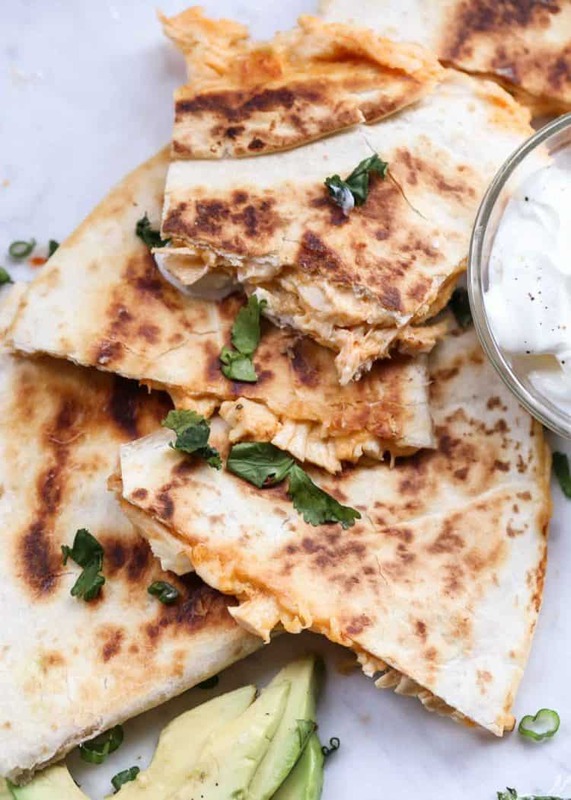 These quesadillas are perfect for leftover chicken – so easy and delicious. 🙂 Enjoy. When I was 16, I worked at Mexican food place. Ate quesadillas literally every day. This chicken quesadilla reminds me of the good old days! Love them hint of spice! Thanks so much for the feedback, ND! I love the quesadilla recipe as well. A recipe couldn’t be any easier. Jessica, you can use any cooked chicken. Your drumsticks will work wonderfully. 🙂 Enjoy!!! You’re so sweet, Jessica. I’m such a simple person though, nothing special enough to meet;). I just had the sweet potato breakfast as well, it’s a favorite for me. 🙂 Have a blessed week. Do you use fresh or canned chicken?.